I’ve been an amateur guitarist and keyboardist since my teens, and at times a semi-professional violist as well. Back in the 1970s, I studied under Prof. Lyman Bodman and played with the Michigan State University Symphony Orchestra as a non-major. In the course of attending some 80+ conventions, I became well acquainted with the world of filking and with most of the then-active singer-songwriters. I used a portion of Kathy Mar’s song “Give My Children Wings” in my novel Enigma. Later, she solicited me to play keyboards and viola (and even sing) on the first of her Thor recordings. 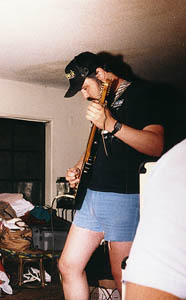 That session led to a number of other recording projects. Those listed below are the ones completed and commercially released. Before my second and third child intervened, Barry and Sally Childs-Helton, Mary Ellen Wessels, Gwen Zak, and myself were rehearsing and occasionally performing and recording at conventions as The Black Book Band. The Dodeka Records release First Contact was the result. 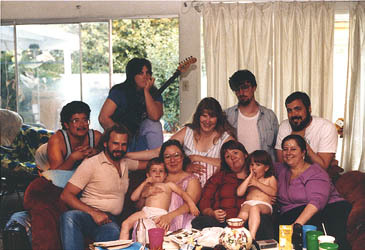 The band reunited for a Guests of Honor appearance at Ohio Valley Filk Fest in 1998. Sideman (synth) on Barry and Sally Childs-Helton’s Tempus Fugitives (Dodeka Records, 2001), a CD reissue of material from Escape from Mundania and Paradox.